Play video League Cup bigger for Stoke or Reds? But Liverpool got the result they came for to put the League Cup final in sight. The fall out from this will rumble on tomorrow for sure. Finger pointing, what will they do next? January signings? There is many a tangent on which this story will evolve. 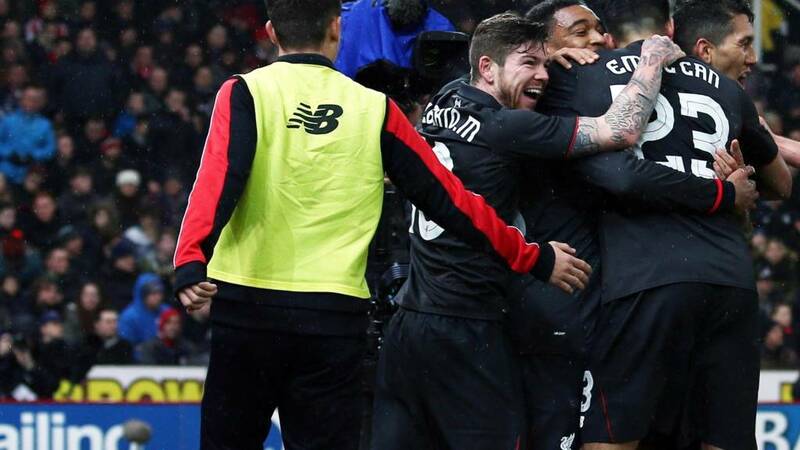 For now though, let's not forget about Jordon Ibe - the youngster got a crucial winner. Who will take the box seat in the other semi-final? Join us tomorrow to find out when we bring you live-text coverage again. Thanks for your contributions tonight, sleep well. "I’ve seen it at some clubs before. Perhaps it's down to the change in training methods on the training ground. Under Jurgen Klopp they’ll train much harder day in, day out. "The amount of medical attention footballers get at football clubs now, and also the physical work which is put in, this shouldn't be happening to footballers. I put the various hamstring injuries down to Klopp’s change in style." If you are just joining us, Liverpool have sneaked past Stoke in this first leg of the League Cup semi-final but at a price. Philippe Coutinho seemed to damage his hamstring in the first half and Dejan Lovren hobbled off with what looked like the same problem shortly after. That left the Reds with Lucas and Kolo Toure in central defence. They got the job done and both excelled, but Toure too looked hurt in the closing stages. It appears he just had cramp. Stoke on the other hand will be frustrated. They never got going and have some real work to do in the second leg. Some more news from Jurgen Klopp's post-match news conference as the German says he takes responsibility for the training and injuries. We will be writing these up in a quotes piece shortly. Liverpool could go to the market then? They may be wishing they moved a day earlier, Charlton signed Roger Johnson yesterday. A chance missed. The winners of this two-legged final will of course play at Wembley on 28 February against either Manchester City or Everton. Everton midfielder Ross Barkley took to social media earlier to express his excitement ahead of the first leg at Goodison Park. His manager - Roberto Martinez - told reporters on Tuesday: "I know for a fact Goodison will be rocking. We have seen our support home and away help the team throughout this competition." We will be live-texting when Everton take on City on Wednesday night. Henry Winter of The Times on BBC Radio 5 live: "There's the physical deterioration but also the managers don't get enough time to spend on the training ground. Either players are recovering or there's a game coming up, so they can't do the tactical works. We are still in the dark ages in preparing." Is football fitness lagging behind rugby? Kevin Kilbane reacts to the two hamstring injuries Liverpool appear to have suffered: "Players are writing down the amount of sleep they get, the quality of it. The way they feel - is it heavy legged? "Fitness coaches have tried to implement this in football. The problem is that you kind of have a rigid week because of the time frame between games. It's all about recovery, getting your body ready. Maybe in rugby you get a week between games. "I think particularly at this stage of the season, you will get muscle tissue injuries." Listen now, click 'live coverage' at the top of this page. Liverpool boss Jurgen Klopp: "The only thing we can criticise is our finishing again. We had a good structure, played football good, everything was good but we don't make enough goals. "The biggest problem for us is we have two and maybe three injured players again. "Very frustrating. The problem is we had too much injury, when the players come back others are injured. It is a cycle that needs to come out. "We have no break, no recovery, Players who never had a problem had no problems in pre-season are fine, for all other players it is up and down." Just 90 minutes stands between them and the chance to make it nine League Cup wins. FA Cup shock on Friday? Liverpool manager Jurgen Klopp believes his squad have suffered two "bad injuries" and Kolo Toure's issue is a "cramp". "It's a strange feeling," Klopp tells Sky Sports. "I'm proud as it was a perfect reaction from the last game. "You saw it was a special game. A good game, liveky, aggressive. Only 1-0 but of course we have two bad injuries and that's why I'm not only lucky tonight. "We now have three injured centre-halves and the only fit one got a cramp in the last minute." Liverpool midfielder Lucas Leiva on Sky Sports: "It was clear we had to change something from West Ham. When we start well we always play well. "We had some bad luck with injury but kept a clean sheet and scoed ab away goal." A look at the stats show Stoke saw a lot more of the ball but in truth, their threat was pretty blunt. Liverpool must face Arsenal, Manchester United and a trip to Norwich ahead of the second leg. Their run of fixtures starts at Exeter on Friday, a game which will at least afford them an eight-game break when it's complete. Boy do they need it. Quote Message: They were on the back foot when Stoke had the pressure but it was the pressure they put on when they won the ball. I saw a different Liverpool tonight. They were on the back foot when Stoke had the pressure but it was the pressure they put on when they won the ball. I saw a different Liverpool tonight. Stoke built up a head of steam but there was an air of desperation about their play all night and Liverpool were the better team. You can listen by clicking 'live coverage' at the top of this page. Interestingly, Kevin Kilbane tells BBC Radio 5 live that the three hamstring injuries Liverpool seem to have suffered come down to the change in training practice Jurgen Klopp's appointment will have brought. Joey Barton has it covered off for us. Hamstrings, player analysis, Liverpool better without a striker, the full package on offer from the Burnley midfielder. Quote Message: We expected a better game. Liverpool deserved to win the match. In the second half Stoke improved but didn't put Liverpool under any real pressure. We expected a better game. Liverpool deserved to win the match. In the second half Stoke improved but didn't put Liverpool under any real pressure.